About Antiques 20050211 - Julie McClure Inc.
"What is this peice of silver for? – B.C., Sarasota"
This is a cucumber server, used for round slices of cucumbers. They haven't been made in the last 65 years. They are not common but you can find them occasionally at antique shows. They can range from $75 to several hundred for a reare pattern by a premium maker like Tiffany and Co. This buttercup pattern by Gorham is valued for replacement at $225. "I bought this table from an estate, I thought it was a Victorian table but now I am not so sure. What do you think'! - KS" Bradenton "
While this table has many of the design elements of a Victorian rococo (1850-1880) table, it cannot be from the 19th century. The roses are stiff and indicative of machine carving. 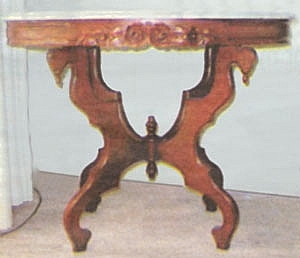 By the mid-19th century, power machinery was widely used to manufacture furniture. However, some hand tools were still used for fine details and finishing, There isn't any trace of hand tool marks. The market for Victorian furniture is sluggish right now, The cost of buying a new reproduction Victonan marble-top table will generally be more than buying a mid-19th century table of the same design and quality. Because this table is a repruduction and used rather than new, the fair market value would be $150 to $250. The replacement value (the value used for insurance) . would range from $600 to $900, depending on the retail source . "This clock belonged to my mother and she inherited it from her mother. My sister and I wondered how rare it is and how much it is worth. -L.G., Bradenton "
Often called grandfather clocks, these are more accurately called tall case clocks. These large walnut carved clocks were made in Germany and imported into this country from around the end of the 19th century until World War 1. They fit perfectly in the large homes with high ceillngs which often were stone and had a European look to them. This was the age of the Vanderbilts, Astors and others who built mansions, Some of the clocks were much more elaborae than this one. There was originally a separate piece, called the pediment, which sat on the top. I talked with the owners who remember the missing piece and hope to locate it. Assuming that the clock is in good running condition and that the pediment can be located, the insurance value would be $10,000 to $15,000.